OH MY GOODNESS! For those of you that are new to the blog- WELCOME, or bem-vindos!! (I hope that translated correctly on Google Translate! lol) I am SO excited and thrilled from the HUGE HUGE HUGE response on my blog yesterday from the country of Brazil! I received 112,000 page views yesterday!! (thats about two-thirds of what I generally get in a MONTH!) So in honor of all my awesome new readers- I give you today's nail design- the Brazilian flag. :) Obrigado!!! I used CND Green Scene as a base, used tape to tape off the diamond shape, painted CND Bicycle Yellow, then removed the tape. For the blue, I freehanded a circle with Pure Ice French Kiss, then used Sally Hansen All the White Stuff for the white band across it, as well as little dots (for the stars). I also used CND Green Scene to paint little squiggles for the words Ordem e Progresso ("Order and Progress"), since I can't paint letters that small. :-D Topped it all off with 2 coats of Seche Vite top coat. Thank you to all my new readers, Brazilian, American, or whatever country you're from!! You rock, and I appreciate you!! I'm from Brazil, but I've been living in Philly/PA for 10 months!!!! Every day I visit some brasilians sites and I found you there!!! !Your art is amazing!!! !You're a great artist!!! !Thanks for the brazilian flag!! !It's amazing... It'll be a sucess in Brazil for the World Cup Soccer this year, for sure!!!! And the Google gave you the right way for welcome!! !Bem vindos!!!! See you and congrats for your nice work!!!!! Hi, i'm brazilian too.. Your nails are awesome.. I write this as a proud brazilian reader! i'm so happy for you post a designer of Brazil! Hi! I'm brazilian too! And i loved your blog! My english is very very bad! But, thanks for the tibute! I loved so much! Hello, I too am Brazilian and I met your blog through a report in Brazil. His art is incredible, I also do designs on my nails, but you get over it! Congratulations! Inspired me to some new designs! Brazilian women are fascinated by nail polish, nail designs, all this matter! And I loved your tribute, thank you! Do not be discouraged to continue faithful in the visit to your blog. i live in london and your designs would certainly make all the londoners go crazy! We brazilians loveee to get our nails done (or DIY) so there´s a thousand websites about nails, and all of them are talking about your project! If you look for "unhas" (nails) or "esmaltes" (nail polish) you´ll gonna find lots of websites and blogs about our passion. I'm from Brazil and visit your blog every day! Google translate translated right! Hope is also translating the law I'm writing. Your blog is wonderful, you have a very good creativity! Congratulations on your blog, keep it up! Hello! I'm Brazilian, and I'm really happy with this little gift for us! I know this blog since last year, and read it every day and often get inspired by your nails. I never left a comment before, and I think this is the time to send you some love. Hey! I'm not from Brazil but I've loved your blog for ages! My favourite was the camouflage manicure but this is definitely a close second :P So skilled! Love the nails you do..you should get in touch with the local Brazilian blogs about nails to talk about your work! congratulatios for your work and hope to have you posting more Brazil inspired nails during the worldcup! Wow! Congrats on all the press, this is pretty cool! Keep up the good work. Also as an aside- this is the second time this week I've heard about Flip Flop Fantasy, I'm just scared it would be too bright for me. I did go get ORLY Terracotta and can't wait to use it! I'm brazilian and I love your blog! Your nails are awesome!Congratulations for all your work! I pout your pictures in my blog, www.milychocolate.com.br follow me. kiss beijos. Oi Melissa, lindo o seu blog, e nós brasileiros agradeçemos o post do Brasil. Sou brasileira e adoro ver as unhas que vocês postam aqui. Obrigada pela homenagem aos brasileiros! Beijos! I'm brazilian and I love your great ideas for nails. You r very creative! Congrats. Awesome look, I love the colours of the Brazilian flag and this looks great! You've got a lot of views from Brazil, because a website called "GNT Globo" made a article about you and your blog. Here in Brazil, do nails is a fever, so, everybody loved your tips!! Keep with your blog, I loved it! I'm Brazillian too, loved your nails, by the way, i love them all. I come here everyday to see you art! Congrats! Hello I'm from Brazil!I love their work. Hi! I'm brazilian, and I really loved your blog! I've read about it in a online newspaper... I showed to my friend too, because she addicted to this nail thing! but congratulations, it's really beautiful! Hi!! I'm brazilian by the way..I found your blog and got in love at first time!! You are an artist! Congratulations and thanks brazilian nail art! the world cup is arriving and this nails will be polished many times here in Brazil! Great blog, by the way. Congrats! Hi! I am Brazilian and I saw your blog yesterday! I was fascinated with his work, posted several photos on my Twitter. And of course, I loved the flag of my country! I´m brazilian too.. and love your nails!! Wowwww.. Now y have brazilian frinds!!! I'm brazilian and EU AMO ("I LOVE" hehe) your blog! I'm glad to see that our country is well seen in the outside :) And, yes. The translation is correct! By the way, AWESOME NAILS! i'm trying to copy some of them, but it's too hard! Very beaty, haha. Love this country, and love nails to! I'd love to have, like... Half you hability and patience to do nail art. OI SOU BRASILEIRA MAS MORO EM PORTUGAL VI SEU BLOG ATRAVES DO SITE DA GLOBO E ADOREI USO UNHAS DE GEL E JA TIREI LGUNS MODELOS PARA FAZER NAS MINHAS A DA BANDEIRA DO BRASIL FICOU MUITO BONITA TAMBEM TENHO UM BLOG AGORA DESDE QUE VI O SEU ...BJS E PARABENS ! I need to teel you that I read your blog everyday, since last month. thanks for your affection to us! Really wanted to be able to do the nails as it does. I'm brazilian and I have you on my rss and feeds, i love what you make in your nails!!! And, our flag is the best one, isn't it? I need to try making something like you did for the World Cup! hahaha u had a great idea doing this art on your nail! it looks a little hard, but is beautiful! Hi, I'm from Brazil, and I'm totally obsessed with nails (have a look! http://www.flickr.com/photos/thaisster/). All I can say is that you're blog is the best blog ever, and I keep wondering how you can do such perfect nail art! And EVERY DAY! As a loyal reader since about two months in, I am so happy you have gotten so many followers. Hooray to the daily nail and welcome to the party, brazil!! OMG! This means a lot to us brazilians, thank you for this present for us! and you nail are incredible! I'm from Brazil :D I love your nails! People just have to say TNKS for apreciate our country. Hello, I'm from Brazil!! I love your nails, Perfect! How nice from you, doing this! Thank you, we appreciate your art - and nails! Karile: Hello, I'm from Brazil! i like to congratulations you, because your blog is notice in one of the best site of moda in Brazil!! eu Ameiii e viva o Brasil! Brazilian girls are just crazy about your nails and your blog. So much inspiration!! Your blog is so perfect! I discovered it two days ago and I fell in love with your nails designs! I´ll definetely post something about you on my blog. Seu blog é demais, sou fã e todos os dias estou aqui conferindo suas idéias, suas unhas são lindas!!! parabéns, querida, e tank you pela homenagem!!! Curitiba - Brazil sends HI! Gratz 4 your blog cuz I love your work in nails!!! Haha, I vistit your blog every day, and I'm Brazilian. And today I saw it. Eu amo esse blog ele é d+++,"thanks" pelas idéias garotas...Congratulations!!!! omfg!!! if you get 100 comments i'm going to freak out!! Brazilian. You are too funny. Congrats on all the news fans. Looking forward to your contest, and thanks for all of the inspiration! Thank you, I'm from Brazil! I see your blog every day, it's wonderful! Hey! Gratz! Im brazilian and i love your nails! And Google translated it right! Hey dear, I'm brazilian too, and i think that you're briliant, very criative and very good artist. Congratulations from us. By the way, a see your blog first time in http://www.eucapricho.com/, from a very sweet brazilian girl, who likes nails a lot. Hello dear! I always sneak on your gorgeous designs, but never commented before! But today I was just thrilled when I saw the Brazilian flag on your nails!!! I really would like to thank you for your attention! Brazilian looooves cute nail arts, and your blog and art is one of the greatest I have ever seen! Hahah congrats for the 112.000 views from Brazil! I'm Brazilian, and I must say, your blog gave me back the will of painting my nails ! Greetings from over here ! Hi!! I'm brazilian and I found your blog in a website from Brazil! Your art is amazing! Congratulations!! Hi I'm from Brazil, my name is Bruna Florência, I see you blog every day. You blog is very famous in Brazil, the link of you blog show in a article in a magazine "Gloss" (it's a magazine for girls).Yes girl, you are famous!! Congratulations!!! your blog, your ideas, your creative are fabulous!!!!!! I'm from Brazil and I always visit here! By the way, sorry, my englhish isn't so good. Hi, I'm from Brazil. i love your blog, congrulations ! I just came back from Brazil.. I can just say: great nails and... SAUDADEEEEEEEEE!!!!! Hi dear, I am from Brazil and like so much your nails are awesome! Every day I look your blog and love your posts! I was happy to see that you love Brazil. Hi dear! congratulations! i'm brazilian too. OWWWWWW...those nails are just amazingggg!!!! I'm also from BRAZIL and I'm always taking a look @ ur website and I just LOOOVE it! Congrats!! Brazilians just love the arts in nails.. I's veeeeery common here!!! Everytime that I go to the saloon to make my manicure, I enter your website to check out some suggestions! All the best, for you!! I think this is the best nail you've ever done so far. I'm Brazilian, by the way! Hi i'm brazilian too! i see your work every daY and i love it! Kiss! Hello I'm brazilian but live in Japan now... I love your blog and you make me happy because you do a brazilian nails!!! Very very cute, and i like your job more and more... Congratulations you're creative!!! Hi!! I'm brazilian, and I love your work!! You're extremely talented! I Loved all of your nails! I'm brazilian, from Curitiba - Parana (south of Brasil), and I love your blog too! Hey this is awsome. I'm from Rio de Janeiro. Love u blog n nails. kiss ;** Perfect Bem-vindo! I'm brazilian too! Loved it!!!!!!!! Beijos! Do u remember that I coment here a few weeks? I hope soo, because that post that I did waas great!!! Thanks about the nail, we brazilians luv it!! So cute!! I'm brazilian too, nail polish lover and here in Brasilia u make a huge sucess!!! Congrats! Amo muito tudo isso hein?! "Obrigado" is for mens, womens say "Obrigada". I love all your nails! I've seen it every day but I didn't commented before... keep with this awesome work! Hii!!! I'm from Brazil , thank you for these nails!!! I always visit the blog and I LOVE IT!!! I hope MY translate (by me , not Google) is correct!! Kisses and keep with this awesome work! I follow your blog every day and I was surprised with these nails the flag of Brazil! Hi!! Loved the design! I live in Brasília, capital of Brasil, and here we have a nail polish brand that sells a kit with the colors and adesives to do this design very easily. Seeing yours proves how good you are! Hey!!! i`m from Brazil too!! I always visit your blog!! And I love it and your nails! Don`t you feel bad when you have to do a new nail over the older? Kissess!! hi!! i´m from Brazil and i have a daughter, she has 8 years and I always make in her nail some of your ideas. She ask everyday to see your new post. She loves your blog. I am brazilian. I loved, thank you! Heyyy.... I'm brazilian....and I have to say: I LOVE YOUR BLOG!!! It helps me so much...you can't imagine...everybody knows me because of my nails.. I use it in different way each week....and I got the ideas from your site! So...Thank you and congrats!! I wolud like to ask something for you, can I? Could you please make a draw with dolphins?? I`m a brazilian fan and that was awesome! thanks! OMG I hadn't seem it before! Thaank you, so beautiful! you took the spirit of our flag into your nails! I got to visit your blog after a blog called "Eu Capricho "wrote on his blog. I hope the google translator is right. Wowwwwwwwwwwwww!!! That is awesomeeeeeee!!! hahahahaha! You were on a brazilian website and I told my followers on twitter about you!!! You are awesome! So creativeeee!!! I'm brazilia, but living in MA. Looove those nails! I'll try to do it for the world cup! hehehe!! Congrats for your job! I'm brazilian, so: GREAAAAT STUFF! i´m very happy so look this photo in here! Congrats! Your nails are amazingly awesome! And thanks for the Brazilian Nails!! oi! sou brasileira e estou no seu blog todos os dias ! Hi, I'm from Brazil, and I L-O-V-E your nails, you are a genious. PS. Yes the translator is right. Nós Brasileiras adoramos novidades, e estamos doidas pra chegar aqui no Brasil os esmaltes que mudam de cor conforme a temperatura (quente, frio e morno). Sua criatividade é show, e obrigada pela homenagem a nós brasileiros com a bandeira do Brasil. Vi a matéria do seu blog e postei no meu http://blogluhfernandez.blogspot.com/ as leitoras adoraram e tiraram muitas ideias das sua pinturas. Um grande Beijos daqui do Brasil. We love Brazilian news, and we are crazy to come here in Brazil glazes that change color according to temperature (hot, cold and warm). Your creativity is awesome, and thank you for honoring us with the Brazilian flag of Brazil. the readers loved it and got many ideas of his paintings. A big kisses from Brazil. keep doing this wonderful job, we appreciate this!!! Hi hi ! I'am from Brazil! Your nails its SO AMAZING! Its perfect! Tanks for the brazilian flag! And you write perfect, bem-vindos! I soo soo mutch fan! Beijos or Kisses! 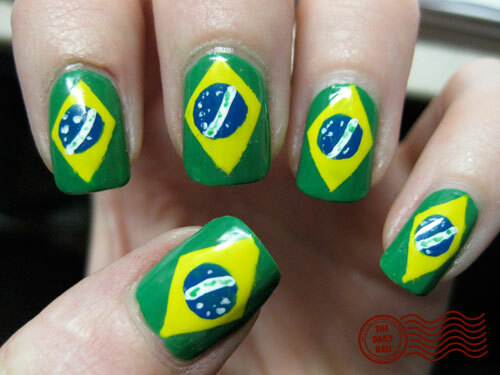 I´m from brazil, i`m very happy you did the brazilian`s flag on your nails! thank you! you are incredible!! !I visit your blog every day and I love your nails!! what you do is amazing!!! and I loved especially this post!! Hello, my name is Carol De Zotti and I'm from Brazil! You are fantastic and I love your arts! congratulations ! and i'll spend my time here ! I'm brazillian. Thank's for the gift. We call our country "Brasil", with "S" not "Z"
Put in translator: Eu sou brasileira e adoro seu blog. I'm Brazilian, and i made arts on my nails like you!